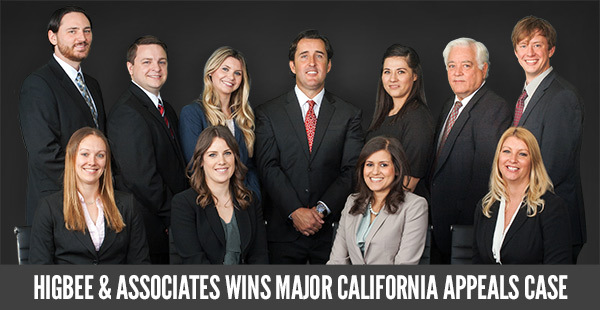 The Law Firm of Higbee & Associates scored a major victory today, both as attorney and plaintiff, when the California Court of Appeals published its ruling in Law Offices of Mathew Higbee v. Expungement Assistance Services. The case provides important clarification about California’s Unfair Competition Law (Business & Professions Code section 17200) and will increase opportunities for businesses to sue competitors who are gaining an unfair advantage by violating the law. Attorney Mathew Higbee says the ruling, which came from the Fourth Appellate District, Division 3, will have legal significance for several important reasons. “This case makes it clear that business who are being injured by the unlawful acts of other businesses can sue those businesses, even when the two businesses have no direct business dealings,” said Higbee. This case stems from a California Superior Court case where a law firm, The Law Offices of Mathew Higbee, sued an out-of-state business, Expungement Assistance Services (EAS), for unlawful acts, including fraud and the unauthorized practice of law. The trial court ruled that the law did not allow a plaintiff who had no business dealing with defendant to sue a defendant. The Court of Appeals unanimously disagreed with the trial court, and even directed the clerk of the court to send a copy of the opinion to the Attorney General, presumably for law enforcement action. Attorneys Mathew Higbee, Ray Ngo, Jennifer Strange, Cynthia Underwood and Matt Slezak represented the law firm on the case. Also assisting were paralegals Katie Sandoval and Lance Hough.